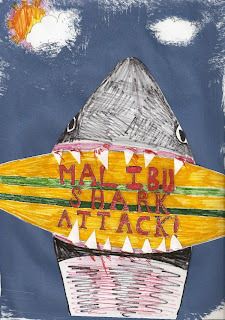 brain tumours for breakfast: I am a nice shark, not a mindless eating machine! I am a nice shark, not a mindless eating machine! I can remember the first time I listened to “Breakfast in NYC”; it was heart-squelching pop in its purest form and instilled in me an unyielding elation. Oppenheimer’s début album was simple, bubbly and blithe; sentiments that Rocky O’Reilly, aka Kid 90210 and his musical allsorts presumably wish to call to mind with their new venture, Malibu Shark Attack! In a month, the band has produced three songs for consumption. The vestiges of Oppenheimer are evident but it’s not quite Doppelheimer. There are magical Moog melodies and vocoders, disco drumbeats, ingredients for a fabulous, frothy pop delicacy. Yet a band in the fledgling throes of musical passion will, more often than not, encounter some teething problems. Especially if sharks are involved. The main problem appears to be that most of the songs lack immediacy. Whilst elements of the songs are indisputably catchy, they have thus far managed to find a grappling hook, appearing to pique just on the cusp of those precious moments of soaring pop. Taken as a whole, the music thus far lacks a certain lustre; a carbonated drink that tastes slightly flat. breakfast in nyc goes on every summer mixtape i make. i can't even help it. post script: this is what happens when i don't have the internet for prolonged periods...comment avalanche.